Learn fundamental drills that will develop your teams skills, offensive efficiency and conditioning. Ben Jacobson is known for challenging the best teams in the country with a disciplined, controlled offensive attack. Through Coach Jacobson's individual and team development on the offensive end, his teams have achieved six 20+ win seasons. 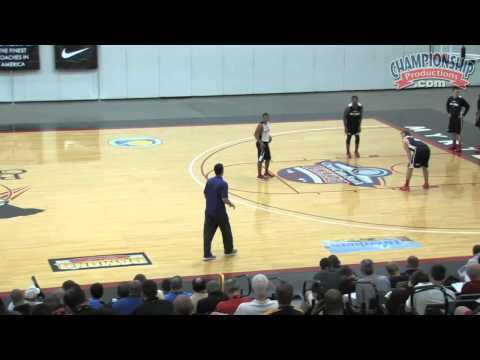 This on-court presentation includes some of his favorite drills to improve not only skills, but also the timing and pace of your team's offensive execution. These drills work great for in-season conditioning, leaving you more time to work on other aspects of the game. Additionally, coach Jacobson shares his transition offense, which includes four options to challenge your opponent no matter what shot they aim to stop. All athletes must be able to do three things well to become a great basketball player: shoot, pass and dribble. Coach Jacobson outlines six practice drills that build individual fundamentals. In his passing segment, he demonstrates "Two Minute Passing," where players work to perfect the art of passing and condition themselves as they move up and down the floor. For ball handling, Coach Jacobson shows his "Corners Drill," which develops players' ability to see the floor, handle ball pressure and use individual offensive moves. You'll learn three shooting drills that condition players and have them build their shooting efficiency as they get 15 shots while maintaining an efficient time. He does an excellent job describing and outlining each drill with easy to understand instruction. Coach Jacobson diagrams three transition sets that Northern Iowa has used during the past few seasons. Each set presents multiple scoring options from the perimeter and at the rim through the use of the pick and roll. On-court demonstrators use the sets in both the half court and full court in a 5v5 setup so you get the feel of how to beat any defensive alignment. You'll see Coach Jacobson diagram two baseline out-of-bounds sets that will give you a shooting option from the corner and a scoring option at the rim against a 2-3 zone, as well as his favorite play for a late-game 3-pointer. Coach Jacobson has proven to be one of the best at getting the most out of his players through the use of individual and team development drills. With the concepts presented in this video, coaches of all levels will be able to improve their teams' skills, offensive efficiency and conditioning. Produced at the Spring 2015 Myrtle Beach (SC) clinic.